The new Megaquarium slot is coming to all RTG casinos in February and we have a special no deposit bonus to let you play for free. 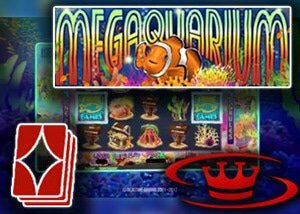 RTG is set to release their brand new slot Megaquarium in February and there is a lot of anticipation around it. This new video slot is based on underwater creatures like fish, crabs, and corals and will take players into the depths of the ocean where they can win big cash prizes thanks to the superb built-in bonus features. The new Megaquarium slot is set to hit RTG casino on the 15th of February and we have secured a fantastic RTG no deposit bonus for our readers, but first let's take a closer look at this video slot. This new slots game has 5 reels and 50 paylines. What's more, it comes with a 50,000 fixed jackpot as well as two progressive jackpots. The graphics are beautiful and the animations will keep you entertained as you spin the reels for big cash prizes. There are six special symbols in this slots game to look out for including wilds, and five scatters that will unlock bonus features. "Few things in life are as relaxing as watching a kaleidoscope of tropical fish gliding and darting through a magical aquarium, which makes the new Megaaquarium slot, whose reels are populated by schools of clown fish and angel fish, perhaps the most gently soothing game...until the bonus features kick in and the excitement levels build." What better way to test out a new release than with a no deposit bonus. We have a great RTG no deposit bonus for our readers to avail of. La Riviera Casino is offering all new players a $10 no deposit bonus when they sign up for a new player account. On top of this, players can also get a first deposit welcome bonus of 200% up to $200. They also have special welcome bonuses for slots players, blackjack, and video poker, so you can choose the one that's right for you. This is one of the top RTG casinos and one that we highly recommend. Why not visit today and use your $10 no deposit bonus to test out all the games they have on offer and be ready to get in on the action when the new Megaquarium slot releases in February.